In my podcast I share everything I've learned about making videos for the web the past few years and help you grow a business through making videos. You’ll also hear from many web video creators who are successfully earning a living from the videos they make. Whether you already have a successful YouTube channel or are just dabbling with video, you'll learn a ton. The first 69 episodes below are audio only, and then there are videos versions from 70 and on. In 2013 and 2014, I co-hosted The Fizzle Show from episodes 1 to 74 alongside Corbett Barr & Chase Reeves (my former co-founders over at Fizzle.co). We helped online entrepreneurs grow their business, revenue and fulfillment until they were buzzing, crackling and fizzling with creativity, impact, potential and purpose. Check out the show on iTunes or check out the full list of Fizzle Show episodes. 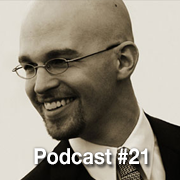 In 2012 and 2013 I hosted a podcast about the transition from employee to entrepreneur. I interviewed 20+ entrepreneurs about how they did it and what they'd do differently if they could go back and do it again. I put the podcast on hold to focus my podcasting energy into The Fizzle Show. You can listen to all of them on iTunes or Stitcher. Or you can see the full list of guests and episodes below.